So what is oyster noodle soup? 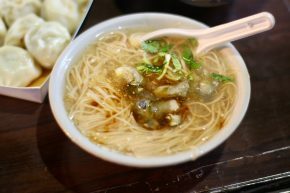 It’s literally a thick broth with salty flavor, stringy vermicelli noodles and chunks of oyster. The trouble is that I really don’t understand oyster. It tastes like pretty much nothing and has the texture of something that would come out of my nose. Therefore, it’s gotta be surrounded by some really good stuff. Unfortunately, I just wasn’t feeling the soup as really good stuff. Maybe it was because it was the middle of summer and I usually feel like soup is better for cold weather or because it’s just better as a drunk food. Or…because there was just too much other good stuff at the Shilin Night Market. Whatever the case, this is one street food I could have walked by with no issue.